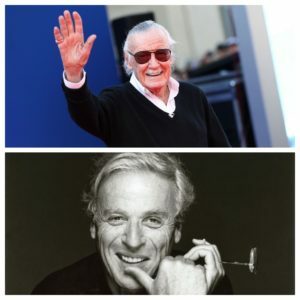 On this latest podcast we pay tribute to the late greats Stan Lee and William Goldman, discuss Detective Pikachu and while plumbing the depth of Gavin’s Pokémon knowledge before (eventually) reviewing The Hate U Give & Fantastic Beasts 2: The Crimes of Grindelwald. Also we should note that we had some technical difficulties while editing the podcast so it may get a little choppy near the and and kind of just ends abruptly. Sorry about that! Send your complaints to @gavyap on twitter, send your praise to @mcnastyprime and follow the podcast a @mcyapandfries on both twitter and Instagram to keep up with the latest podcast! Fatman Beyond Stan Lee tribute episode with Kevin Smith and Marc Bernardin. …and don’t forget to head on over greenroom136.com and show them some love and buy a backpack or urban carry gear!